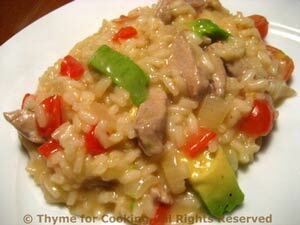 Pork, Red Pepper and Avocado Risotto, Thyme for Cooking one dish dinner. Avocado is not a typical ingredient for risotto, or other hot dishes, but, added at the last minute, it stays intact and just starts to melt into the hot rice, adding a luscious creaminess. Add the Parmesan and the warm condimenti, stir well. Add the avocado chunks and stir gently. Heat olive oil in nonstick skillet. Add onion, red pepper and sauté 5 minutes. Add pork and sauté until done, 7 - 8 minutes. Cut the avocado into chunks when ready to use.